Gartner defines the unified threat management (UTM) market as multifunction network security products used by small or midsize businesses (SMBs) (< 1000 employees). For leaders quadrant, no changes since 2015. 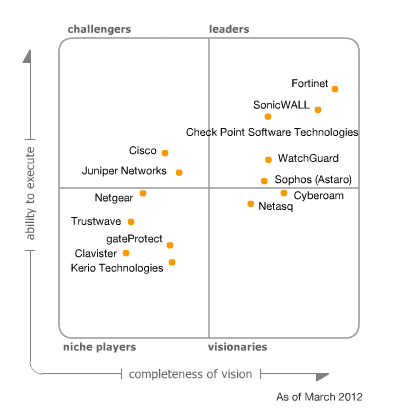 Fortinet, Check Point and Sophos are in there. Not much changes from 2016. 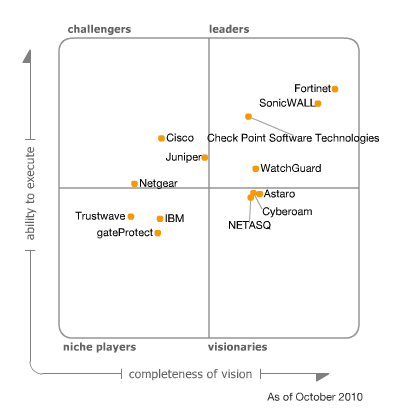 Fortinet, Check Point and Sophos are in Leader Quadrant this year. 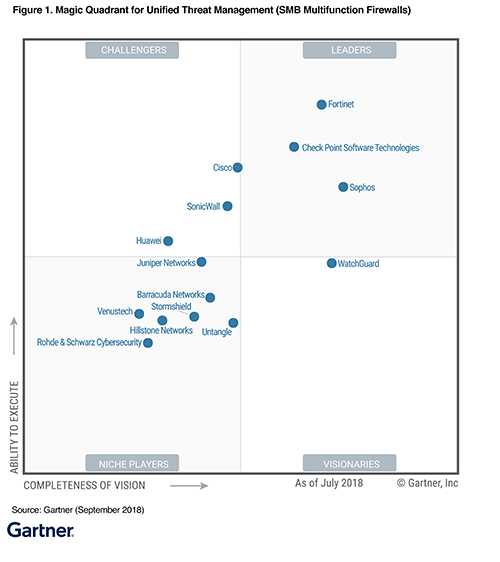 Checkpoint named a leader in the Gartner UTM Magic Quadrant 5 years in a row, and since 2008, Checkpoint only missed Gartner UTM 2009’s report in leader quadrant. 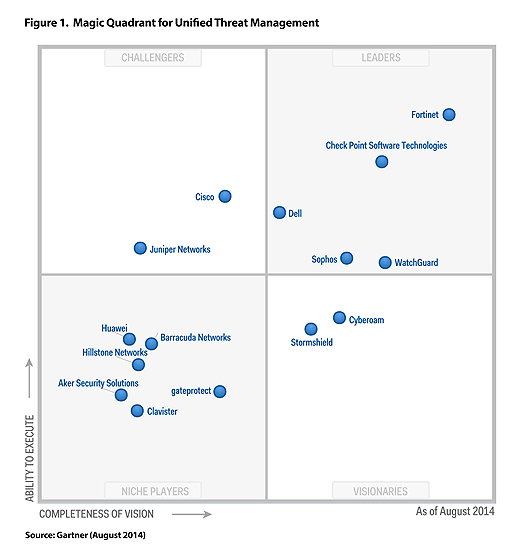 Gartner has positioned Check Point as a Leader in the Magic Quadrant for the fourth consecutive year in Unified Threat Management (UTM)1. Actually not big changes from 2013’s report. Stormshield replaced Netasq into Visionaries quadrant. 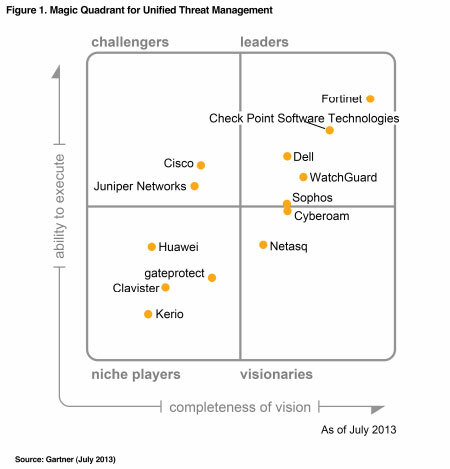 Checkpoint is continuing its leader position in 2013 Gartner’s Unified Threat Management (UTM) Magic Quadrant for the third consecutive year. 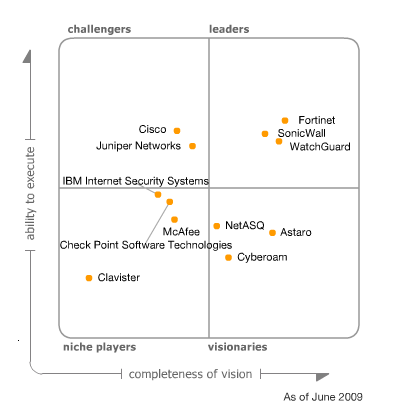 2009 – Checkpoint was not named into leader, but in niche players quadrant.